Hosted by the Shippensburg Area Chamber of Commerce, D.O.I.T. 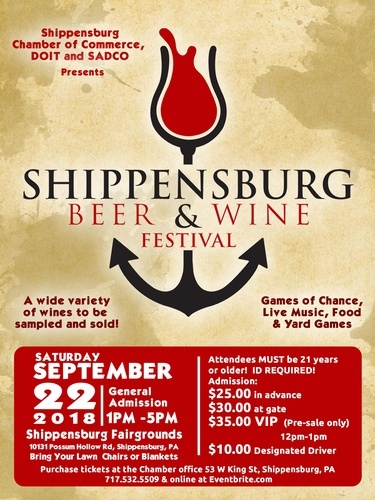 (Downtown Organizations Investing Together) and SADCO (Shippensburg Area Development Corporation), join us again for the Shippensburg Beer & Wine Festival! Featuring a wide variety of wines to be sampled and sold and craft beer tastings. Also enjoy food, live music, yard games and games of chance. Bring your lawn chairs or blankets! Attendees MUST BE 21 years or older and ID REQUIRED!